Not much to say about this session. It is what it is. A journalist from East Bay Express is to show up and cover an ICS meeting. Because I'm a media whore, I broke away from diaper duty to cobble up a session and attend said meeting. BTW, here's a link to the article. About the session: I did one song. Well, actually it's a bunch of little songs all put together. It's a veritable ICS potpourri. But since it's one track number, it's one song. This be me first session as a parent of a crazy, enrgetic infant. Five songs I give thee. The "just another session" session. Yup. I managed to crank out four "songs" this time. Listen at your own risk. It's been a year since my first Wiglodge meeting. Here are five songs in celebration of my Wig-o-versary. So, I'm in the middle of re-aranging the studio and....well, everything is everywhere. It pretty much looks like a bomb went off in there right now, but I did manage to get six songs. The Wigs-giving session! a.k.a. the 'Sudafed' session. I had a cold, that's my excuse. I did 20 songs!! I used the "assembly line" method for this session. First I created 20 blank projects off of a template, then I went and layed down drums on most of the tracks, then bass, then guitars/keys. I wrote lyrics and layed down vocals last. Windchimes with a heavily reverberated disco organ? The "Pepto" Session - I had a bit of a stomach bug that day. The first session in the new place! Mixerman - A tribute to Mixerman the martini connoisseur. SPAM - A song about those weird spam emails that make absolutely no sense. Trainwreck - This one is unfinished. Palm Trees (in Alaska) - This one was supposed to not make sense, but it ended up being about global warming. Swamptounge - Yes, I know 'tounge' is spelled 'tongue'. The misspelling was intentional.....really, it was. Sunset - No animals were injured in the recording of this....the mixing, however was a different story. Poor gerbil. Rock'N'Roll Baby, Yeah - Napoleon Bunnymite Remix - This is a remix of Brother Bunny's Rock'N'Roll Baby Yeah featuring samples from Mixerman's radio show promo. Great River - I recorded this onto a 78 rpm record.......just kidding, actually, I recorded this on a laptop computer with the built-in mic and added the 'scratch' noises in Nuendo. 15 Second Game - Also referred to as: The Forced First Take. This is what it would sound like if the Three Blind Mice had access to a recording studio. Also unfinished. Brainfart - It's probably not a good idea to listen to this one sober at all. This session almost didn't happen, my schedule has been crazy lately but miraculously I was able to get off of work early enough on Friday to do a session. So, it started at 3:30 PM and ended at around 3:30 in the morning. 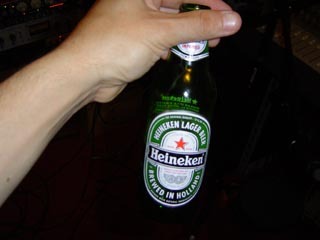 12 hours and a 12 pack of Heiney later, I ended up with 14 songs this time. I should also note that the songs on the CD weren't in the order they were recorded. But, here, they are in the order they were recorded. Where did the hamster go? WTF? - It's a noise track with a shredding bicycle solo. Down - It started off as a reggae song, and ended up like this. O RLY? - A silly tune inspired by a silly internet cliche spawned from a form forum/chat 'shorthand'. The Foxtrot - It's not really a 'Foxtrot'. I don't even know how to Foxtrot. The Microsoft Rag - all the noises in this song are default Windows XP sounds...just tweaked a little. I think Ike Turner said it best whe he said "not a damned thing"